Born and raised in Lowell, John Haley dreamed of becoming a business owner in his hometown to provide jobs, support the local community, and help improve the quality of life in Lowell. As the President & CEO of Watermark, he is excelling at all three. John co-founded Watermark in 2001 to provide environmental expertise in the design/build market, maintaining in-house architects and engineers working collaboratively with in-house construction staff throughout the process. 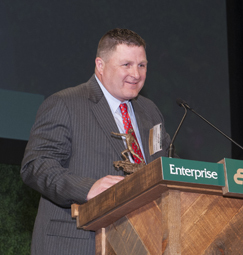 Through John’s leadership and vision, Watermark has grown from a two-person operation to a $27-million-a-year company with offices in Lowell and Hanover, MA, and Fort Washington, PA. With corporate responsibility as a Watermark goal, John is actively engaged with the community, serving as Chairman of Project LEARN with the Lowell Public Schools, donating time and money to dozens of charitable non-profits, and encouraging his team to get involved in community service, including Watermark’s Adopt-an-Island program.